Game Of Thrones fans are gone love this tank top. This tank top shirt is a black burnout color and on top of that you can find the direwolf from the Starks. And of course besides the picture of the wolf it also says “Winter Is Coming Stark”. This women’s racerback tank top come in sizes Small – XLarge. A shirt like this will stand out and that makes it even better as now the world will know witch side you are on. Game Of Thrones is amazing and wearing this shirt while watching it will almost make you feel part of it. Game Of Throne fans will love this t-shirt. This black t-shirt shows a winter landscape in the background and on top of that the Starks wolf logo and the words “Stark” and “Winter Coming”. 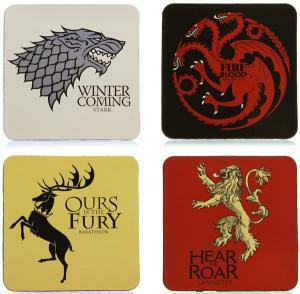 It all looks special and different then most merchandise for the Game Of Throne. 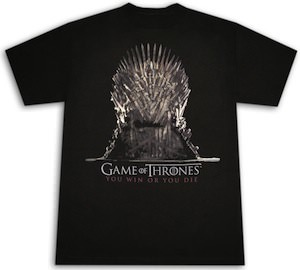 This Game Of Throne t-shirt is made from 100% cotton and comes in sizes Small – 2XL. 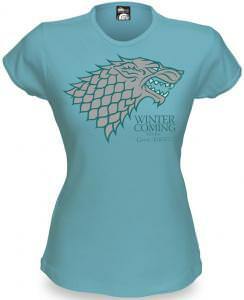 Get ready for the Stark family by wearing this Game Of Thrones Stark Winter Coming T-Shirt. Are you a supporter of the House Stark? If so then you should check out this Game Of Thrones ring of the Stark’s. The stainless steel ring has a silver looking finish and ontop there is the wolf logo of the House Stark. This Game Of Thrones ring comes in different ring sizes so that you can make sure it will fit you perfectly. Game Of Thrones fans this t-shirt has it all. The t-shirt is black and shows the big iron throne that is of course one of the big symbols of the Game of Thrones. Besides the throne the t-shirt also says “Game Of Thrones You win or You Die”. This black Game Of Thrones t-shirt comes in a range of adult sizes and is made from 100% cotton. Get your game on and order your Game Of Thrones Iron Throne T-Shirt. The grey dire wolf is the logo of the House Stark from the TV series Game of Thrones. You can now have a sticker that shows this wolf logo in all it’s glory. The sticker is die cut and that means that it is just the shape of the wolf, no big square that is not used. And this sticker is great for decorating almost anything from your laptop to your wall or maybe the mirror in the bathroom. You could even put it on your car as it is waterproof and they say it will last till up to 18 months outdoors. If you ever get sick of it then no worries either this Game of Thrones sticker is easy to remove. Winter is Coming! That is the syaing for the House Stark and the direwolf is the symbol. This is a pair of book ends that are based after the TV series Game of Thrones, on each bookend find a very magestic looking direwolf sitting up very straight and proper while on guard. 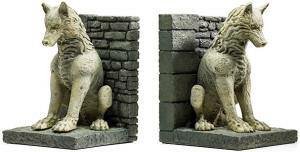 Made to be very durable and heavy these bookends are carved out of resin and then painted to look like stone, each bookend weighs 6 pounds and is 8 inches tall. The awesome TV series Game of Thrones has made fans out of all of us, this is a poster that the Game of Thrones fanatic will definetely need to have. 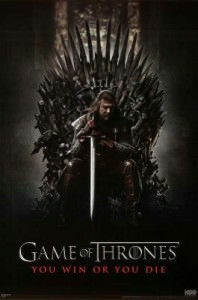 This poster features the HBO TV series advertisement for Game of Thrones, find the official text “GAME OF THRONES” along with “YOU WIN OR YOU DIE”, also there is a high quality image of the iron throne that all the families are fighting to rule and find Eddard Stark Lord of Winterfell and Warden of the North. Measures 24 inches x 36 inches (60.96 x 91.44 cms) unframed and is available unframed or in many different style and colors of frames also check out the choices of print style. Decorate your kingdom with Game of Thrones You Win or You Die Poster. If you are a huge Game of Thrones fan then this t-shirt needs no introduction. On this t-shirt you will find a grey direwolf head in immense detail, look at the fur scales and pointy teeth, also you will get the trademark saying for the House Stark of Winterfell “WINTER IS COMING ” and in smaller text you will see the text “Stark Game of Thrones”. Made from 100% cotton to make a very soft t-shirt yet still durable, the t-shirt shown here is a babydoll style which means it is fitted to be tight, available in sizes Small to Xlarge.